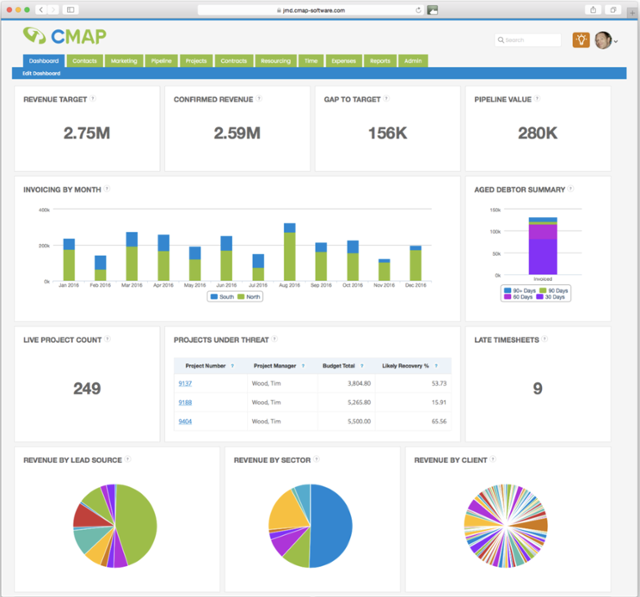 ‍CMAP is a SaaS company that provides enterprise project management software to professional service firms. CMAP serves a diverse range of clients, from architectural firms to healthcare consultancies, and operates under the philosophy that software, no matter how powerful, should be a joy to use. Tom Rains joined CMAP to help customers become more successful with the product. 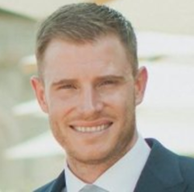 As the Implementation Consultant, Tom helps customers understand CMAP’s robust feature set and collaborates with the product team to improve the software. The developers at CMAP are constantly rolling out new features to improve the user experience. CMAP releases about 20 new features or updates biweekly. Tom realized that in order for updates to be valuable for customers, the team would need a better way of communicating new features and encouraging adoption. 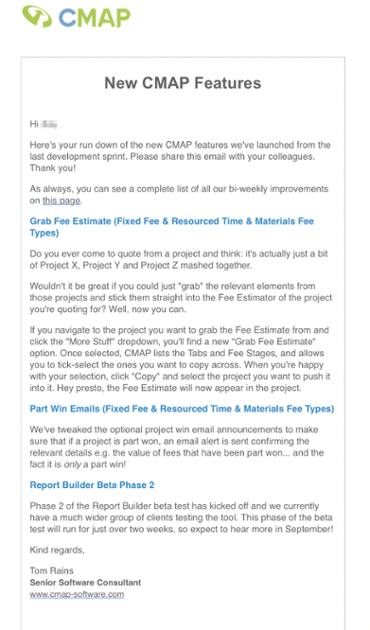 CMAP had been using email campaigns for feature announcements. Tom would send emails out to customers letting them know what the CMAP team was working on. When the features launched, Tom would follow up with another email saying that the features mentioned in his last email were now live. To avoid bombarding all users with emails, Tom had segmented out users by roles (typically admin staff) to receive these feature announcements. The hope was that the announcement, and adoption, would cascade onto the company. Here’s an example of one of Tom’s email announcements. 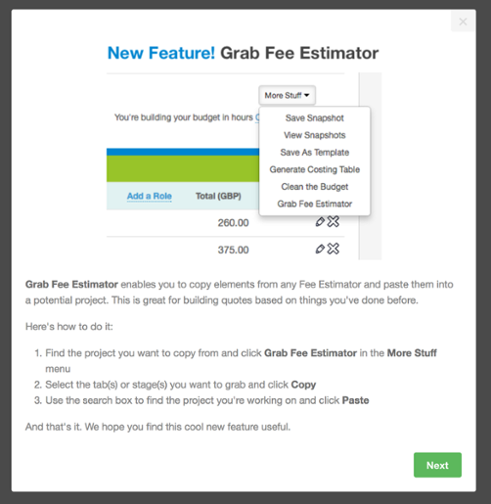 The email tells customers about two new features, the Grab Fee Estimate and Part Win Emails, and provides an update on another initiative. Tom wanted to find a solution that would allow him to quickly announce feature updates in context, right in the CMAP platform. 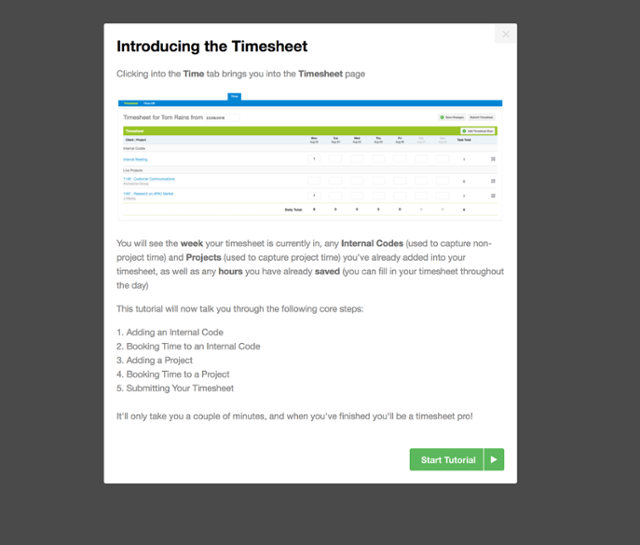 He needed something that would proactively alert users to new and improved features and guide them through adoption. They tried several products before landing on Appcues. Some were too lightweight, with Tom surprised that products aimed at supporting users often lacked in-product and contextual help themselves, leaving him frustrated. When Tom and his team found Appcues, they were very impressed by the easy-to-use interface and clean, modern look. Tom estimates that there is now closer to a 20% take up of the offer to turn on new features. That's a 300% increase from using email announcements alone. Now that customers can use Appcues to learn about the rich feature set CMAP offers, Tom can turn his attention to other challenges. One of these challenges is onboarding through on-site training. When new customers buy CMAP, Tom and his team would conduct a day-long, on-site training session to teach the company how to use CMAP. However, once they are up and running with CMAP, it is up to the company to train new users. Tom is now looking at the possibility of using Appcues to onboard new customers within the product. Tom predicts that this would be improve the customer experience, since users will be able to learn CMAP in their own time and at their own pace. It’d also allow CMAP to focus on other growth initiatives, since onboarding will be much quicker. For a constantly evolving product like CMAP, it’s crucial for the team to be able to communicate with customers easily and experiment quickly.